- Inner core made from natural latex foam. - Designed with special curve to support lower rear and buttock. 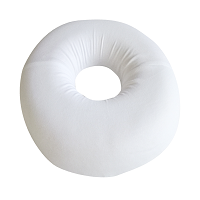 - Designed with middle dimple for patients with bottom pain or hernia condition, and fractured vertebra coccyx bones. - Can be placed on top of chairs, cushions, or car seats. - Help alleviate pains for patients with hemorrhoids after operation. Dimension : 40 x 40 x 9 cm Remark: FREE SHIPPING.